Newspapers pay tribute to Goa chief minister Manohar Parrikar, this morning. He had died Sunday evening. The Times of India recalls his tenures in its headline, “Parrikar, 4-time Goa CM and ex-defence minister, no more”. The Hindu says he “bids adieu”, The Indian Express balances his death with its impact on Goa, “Parrikar loses his battle with cancer; Goa in political turmoil”. Hindustan Times keeps it simple: “Goa chief minister Parrikar dies at 63”. It writes that he was “widely considered the tallest Bharatiya Janata Party (BJP) leader from the state”. TOI says his “stature far outgrew the small state he led with flair and distinction”. 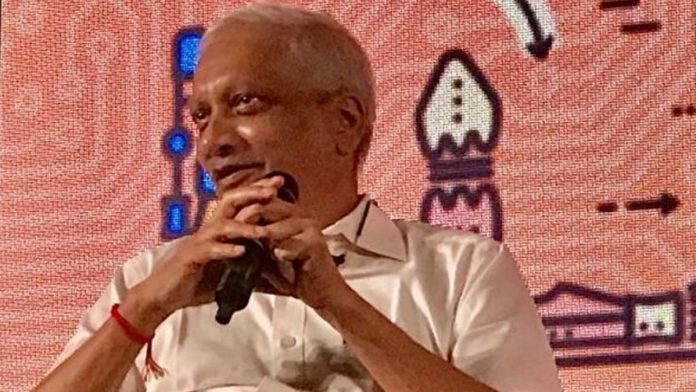 Express says of his leadership style that his “unobvious and independent style, backed by swift decision making would come to define the political career of Manohar Gopalkrishna Prabhu Parrikar”. The Hindu sticks to narrating the arc of his health and its decline. Other newspapers touch upon the political turmoil Goa has now been plunged into: Express writes the BJP was forced into a “huddle, after which the parties acknowledged that ‘the chances of his getting better were slim’”. The other big news of the day is the declaration that retired SC judge P.C. Ghose “is set to be” the country’s first Lokpal — Hindu and HT stress his appointment is “likely”. TOI writes that the selection committee “is understood to have cleared Justice Ghose’s name”. Express and Hindu report with far more certainty: “…his name was cleared and recommended by the high-level selection committee chaired by Prime Minister Narendra Modi” (Hindu). The newspapers point out that Congress leader Mallikarjun Kharge did not attend the meeting. Election-related news is hard to spot on front pages today, but half page advertisements have great prominence. TOI fits in a tiny column of “Dance of Democracy” featuring one liners on the state of affairs in Uttar Pradesh, Bihar, Delhi, and West Bengal. HT is marginally better, giving column space to “Cong to leave 7 seats in U.P. for SP-BSP combine”. Hindu gives page 1 space to “AIADMK, DMK to face off in eight seats”. Others reserve these stories for their inside pages. The Express front page is bereft of election news but it does have two other important leads in: “NCERT drops 3 chapters from class 9, one on caste struggles” where it finds the exercise was “initiated at the HRD minister Prakash Javadekar’s behest to reduce the burden on students”. The other is “Chinese envoy says optimistic that Azhar matter will be resolved”. The lead today is the DMK and ADMK announcing their candidate lists. The demise of Goa CM Manohar Parrikar is featured only by Dinamani on the front page. Newspapers lead with the death of Manohar Parrikar except for Dainik Jagran. Dainik Bhaskar writes on a black strap: “Goa ke 4 baar CM aur rakshamantri rahe Manohar Parrikar ka nidhan, aaj rashtriya shoke” It says, he had cancer but worked everyday, even an hour before his death he was talking of work. Dainik Jagran‘s big story Justice PC Ghose’s selection as the first Lokpal. Among major newspapers, The Economic Times alone notes Parrikar’s death on its editorial pages. In “After Parrikar: End Political Drift in Goa”, it writes that the death of a “senior and able leader” will leave Goa in “political uncertainty”. In a house of 37, BJP now has 10 MLAs and Congress 14 — the single largest party. ET writes, BJP will “naturally seek to form the next government” but advises the governor that the way to respect the “will of the people” is to convene the House, ask it to “elect a leader”, who should then form the next government and test his majority on the floor of the House — “not in the governor’s chambers”, it writes. Hindu and TOI lead with the tragic terrorist attack in New Zealand, though they take very different approaches. TOI in “New Zealand Terror” says the attack “indicates the spread of hate crimes” to “every corner of the world”. Racism, Islamophobia, anti-immigration combined with lax laws on semi automatic weapons led to the attack, it writes. Equally gruesome was the live streaming of the attack — something done by the Islamic State, and even “Hindu fringe groups” after their lynchings. Prime Minister Narendra Modi’s swift condemnation of the attack may leave some Indians “wistful” that the PM does not react as swiftly to such crimes in India “where hate and divisiveness run amok”. New Zealand Prime Minister Jacinda Ardern has “embraced the migrant and refugee community” — TOI thinks her example deserves “emulation in India”. The Hindu, in “Christchurch massacre”, speaks of the rise in far white terrorism that is “anti-Muslim, anti immigration and anti-Semitic” in ideology. It is a major “political and security threat” and on the rise in Europe — Germany, Italy France and Britain have seen hate crimes. The Hindu writes the “language” such attackers use “resembles that of mainstream anti immigration politicians” like US President Donald Trump. It says societies need to “wake up” to this threat and create a “counter-narrative” to white supremacism. The death of Goa chief minister and former defense minister Manohar Parrikar Sunday evening, led almost all television news channels to pay their respects to the four-time chief minister and consider his political legacy. Most debates were suspended in his honour. Aaj Tak called Parrikar a fighter whose political career remains unblemished. Zee News spoke of how respect for the former CM cut across party lines and different ideologies. Republic Hindi stated that the state of Goa has lost its true son and India has lost a true patriot. News Nation and NDTV India carried simple, similar headlines stating, “CM Parrikar ka Nidhan” and “Goa ke CM ka nidhan”, respectively. CNN News18 stated that Manohar Parrikar, a technocrat-turned politician was known for his administrative acumen and clean image, which left an indelible mark on the politics of Goa. Across television channels, political leaders from various parties expressed their grief over his demise. J&K Governor Satyapal Malik recalls fond memories of his association with #ManoharParrikar. Listen in. Previous articleDainik Jagran: would Rahul Gandhi have risked lives in IC 814 hijack?